The developer's of the Internet application suite SeaMonkey have released version 2.49.2 of the application for all supported operating systems. They note that the release won't be offered via the integrated updating feature for most configurations because of changes that it introduces. Users who want to upgrade to the new version may need to download it from the project website to install it manually because of that. It is highly recommended that you back up the profile folder before you run the update as some files may not be compatible anymore with older versions after the upgrade. In other words: you may not go back to a previous version without losing access to some data. Mozilla changed the internal format of the browsing history database. While that is a non-issue if you update from a version of SeaMonkey that uses the old format to a version that uses the new, it becomes an issue if you want to downgrade again as this is not possible. SeaMonkey will rename your history file to places.sqlite.corrupt and create a new places.sqlite file, effectively resetting your browsing history. SeaMonkey users who use the built-in email client may run into issues as well. Summary files may not be read properly if you downgrade SeaMonkey after having upgraded it to the latest version. SeaMonkey users should delete the .msffiles in the local folders and for Pop3 accounts to avoid data loss and resolve the issue. The release notes offer further information on known issues and incompatibilities. The team notes that some extensions may not work properly anymore in SeaMonkey 2.49.2. The browser is based on Firefox 52.6 ESR currently. SeaMonkey does not support WebExtensions currently because of that. This is going to change but likely not anymore in 2018. I suggest you read the full release notes on the official website for a full rundown on changes and how these may affect you. Now You: Do you or have you used SeaMonkey? SeaMonkey, Thunderbird to join forces after Firexit? Why do people use seamonkey? I still have SeaMonkey as a backup, but don’t touch it as much. It’s still a very capable browser and email client though. I was a little surprised how quiet it is in response to a new release of SeaMonkey. Says something I think. I suppose it’s sad, because it was a nice option for me up to about five years ago. But time moves on. It appears after Firefox ESR moves to v60, SeaMonkey will make the Quantum Leap. So it really won’t offer much different in the way of choice. May as well just run Firefox Quantum and Thunderbird Photon. I’ve never been a SeaMonkey user (I prefer my applications to be more single-purpose), so don’t have anything to say about a new version. But I’m a bit sad to hear that it’s going to go Quantum, I sorta had it in my mind as a place to run in case Thunderbird goes too far down that path and end up wanting to switch to a different mail reader. That means I have one less escape hatch. “after” as in: for the official releases. 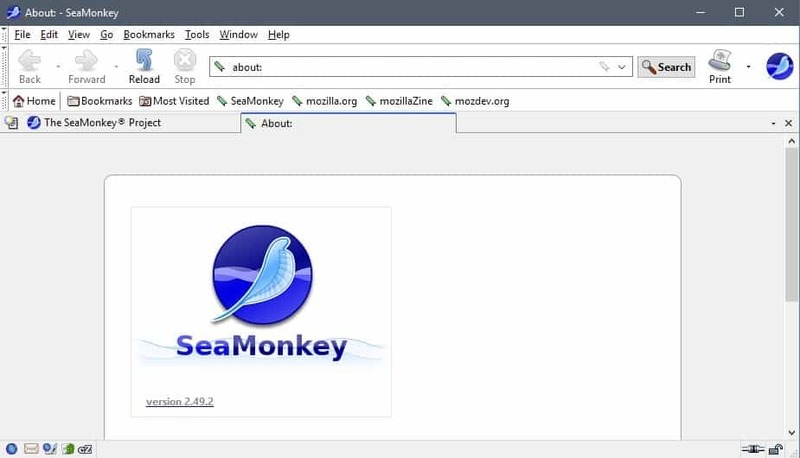 The dev releases of SeaMonkey on Mozilla’s FTP have already moved to Quantum. I’ve never been a fan of the interface and think that they should update it a little, but die hard fans will probably protest, anyway it sure brings back memories of Netscape Navigator. But at least SeaMonkey, unlike the current Firefox, lets you install full themes. So if you don’t like the interface, just install a full theme. Yes, sure I use Seamonkey, as a successor to Netscape since the start of the Internet in 1994. I edit my 6000 page scientific notes file with Composer, which is great for copying and pasting (with a vertical bar as quotations) from web articles. If I use standalone applications such as BlueGriffon I get Russian error messages (for a Dutch user:). Pity so many people made a fork of Seamonkey. Just join the club again folks! United you can do so much more. Has anyone heard of any SeaMonkey betas coming out (based on ESR 60?). I’m cruious as to how SeaMonkey Mail might look with the Photon interface. Very little to read on this from MozillaZine. SeaMonkey 2.57 will be build from the comm-esr60 repo.